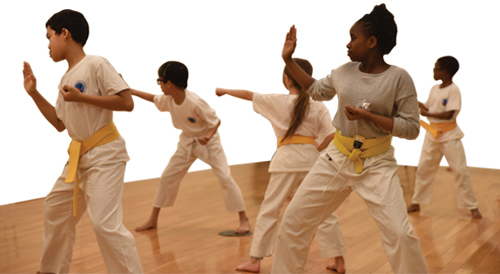 The purchase of the West Philadelphia Community Center will supplement the University’s community programs; among them, youth karate classes. Four years after the Dana and David Dornsife Center for Neighborhood Partnerships opened its doors to the Powelton and Mantua communities, Drexel announced plans to expand programming offered to the community with the purchase in June 2018 of the West Philadelphia Community Center. The center is a two-story, 37,000-square-foot facility at 3512 Haverford Ave. that has been home to childcare services and after-school and summer programs for the neighborhood since 1986. Caring People Alliance (CPA) owned and operated the space but will be relocating to another facility. The programs run by CPA will continue at the center for another year while the University works with local residents to determine how the facility can enrich both Drexel faculty and students engaged in community-facing research, teaching and service, and residents from Mantua and Powelton Village and throughout West Philadelphia. The purchase was made possible with the support of a gift from Dana and David Dornsife, who are also the benefactors of Drexel’s Dornsife Center for Neighborhood Partnerships, Dornsife School of Public Health and Dornsife Office of Experiential Learning in Drexel’s LeBow College of Business.